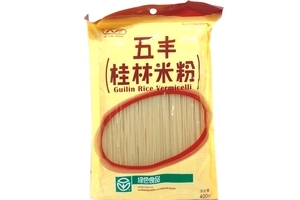 NG Fung Brand Guilin Rice Vermicelli in 14.1oz (400g) bag. Guilin rice noodles, mifen, is the most famous and popular local snack in Guilin. It is pliable but strong, fragrant and mellow, and cheap. Local people consume it as breakfast, lunch, or dinner. Product of China.